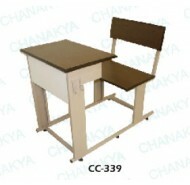 Established in the year 1990, Chanakya & Company, an ISO 9001-2000 certified company, is engaged in manufacturing a wide range of school furniture, modular furnitures for office etc. Designed using quality material like teak wood, partial board, mdf, hdf and merin ply, our wide product line encompasses classroom desks, office workstations, laboratory furniture, modern classroom furniture, modular partitions, executive chairs, school storages, library furniture, computer chairs, cafeteria furniture etc. In addition, we also offer wooden lab, wooden cafeteria table, medium back chair and visitor chair.Designed to perfection, our range has received an overwhelming response from clients based across the nation. We also offer customization in terms of finish, design, color and size. Further, maintaining consistency in our quality standards, meeting consignment deadlines and following ethical business practices have helped us to serve high profile clients.